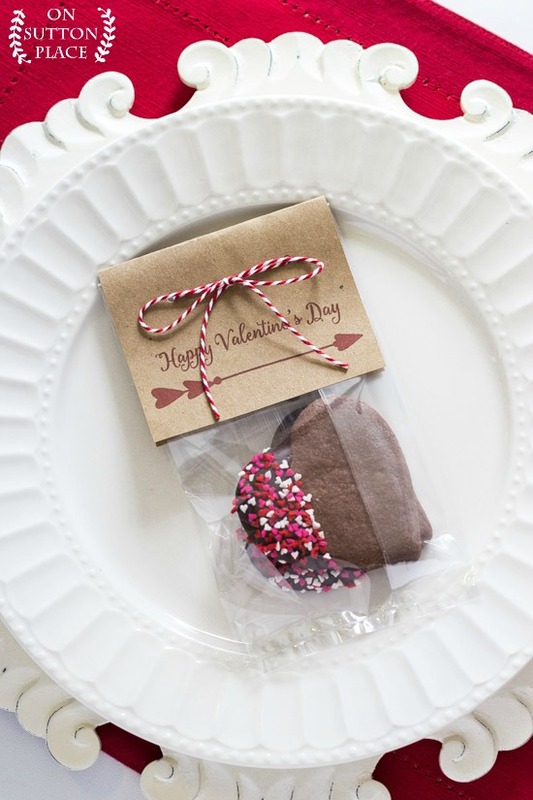 an idea for a DIY favor baked in your very own kitchen. I invite you to join me and celebrate Valentine’s Day! 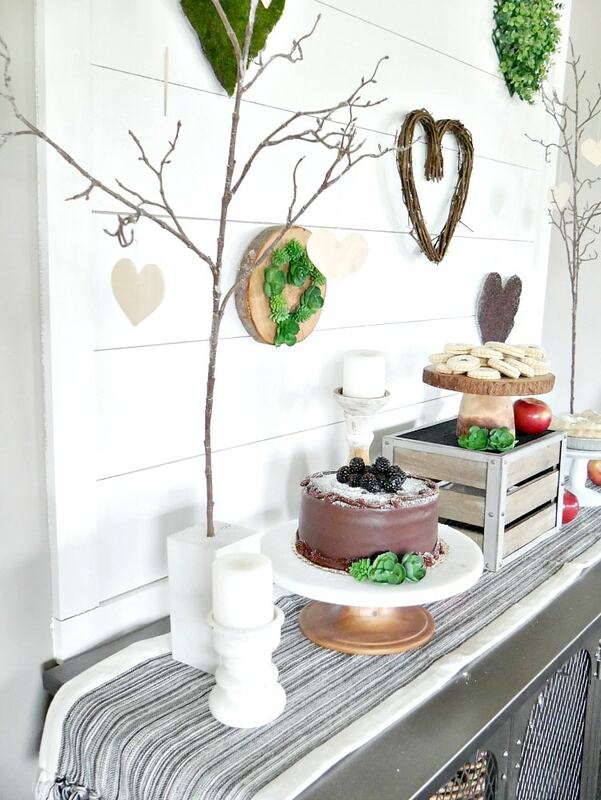 Welcome to another edition of Styled & Set, which is a lovely Holiday Entertaining Blog Tour and the brainstorm of Lory from Designthusiasm. You can see our Thanksgiving tour HERE and our Christmas tour HERE. 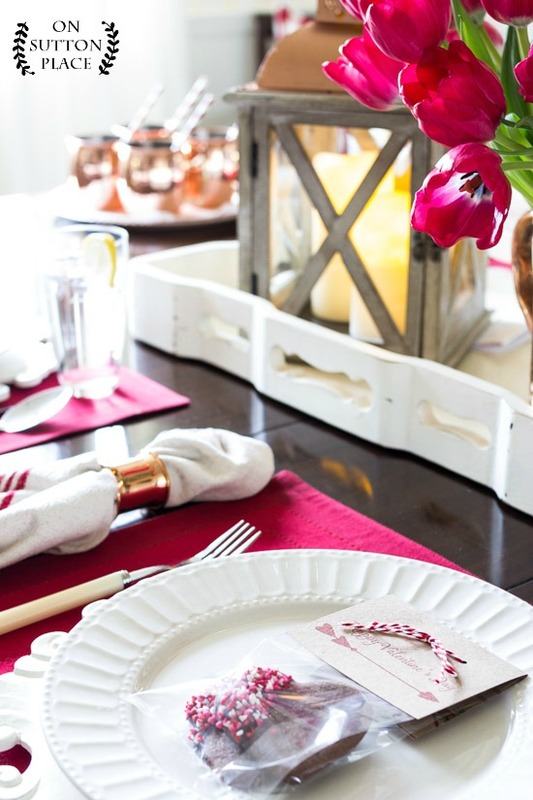 I went with pops of traditional red for my Farmhouse Inspired Valentine’s Day Tablescape. I thought about going neutral or even pink, but I think Valentine’s Day needs a pop of red! If you are joining me from Setting for Four…welcome! At the end of the post, I will be directing you to the next stop on the tour. We have a full week of inspiration from some amazingly talented bloggers. So far the images have blown me away. Whenever I “set the table,” as my mom used to say, I usually start with the linens. I think about what I have and if there’s something I can use that will fit my theme. I wanted these red placemats at Christmas, but talked myself out of them because I had perfectly good plaid ones that I love. Not this time! I decided to splurge and treat myself…and I’m so glad I did. I have this version from Pier 1 in navy and beige too, so if I want to mix and match, I can. Next, I usually decide on the centerpiece. My centerpieces are simple and almost always involve a tray. For this one, I started with a painted wood tray and added a lantern, flowers in a pitcher and a candle. I am still loving anything copper…especially these napkin rings that were a Christmas gift from my son and daughter-in-law. Clearly, they read my blog and knew I would like them! The copper top lantern, pitcher, and moscow mule mugs added some shine and pulled everything together. So what are the farmhouse style elements that inspired this table setting? The lantern for sure, the wood tray, the grain sack stripe napkins, the ivory plates and the vintage glasses. It’s not all technically farmhouse, but by adding a few elements, I achieved the welcoming look I was going for. 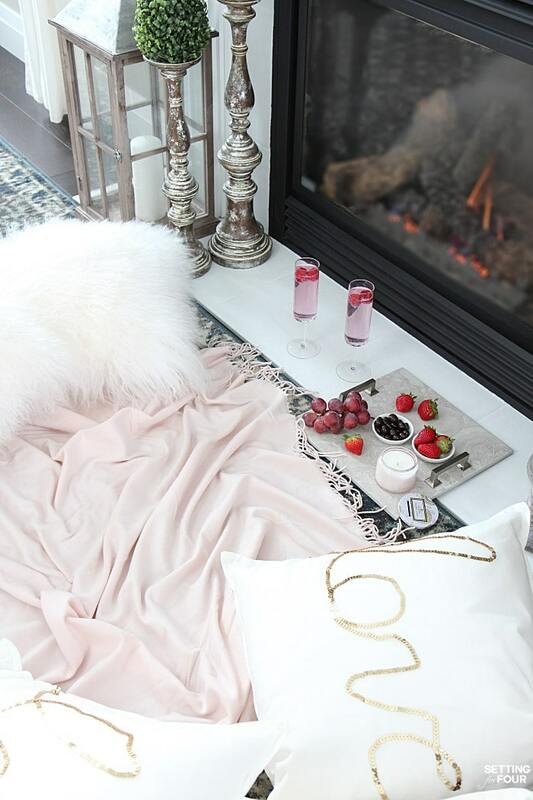 Cozy but not over the top. 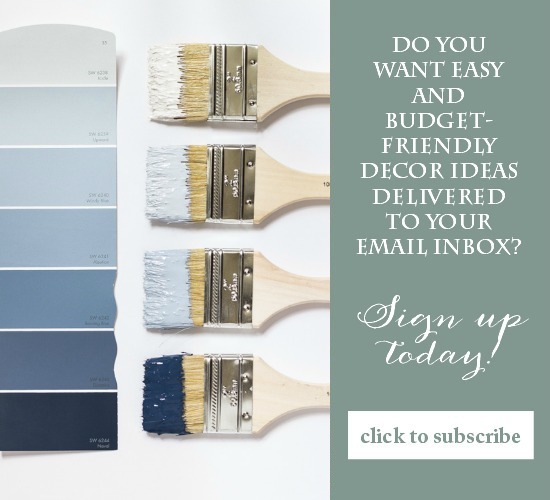 Before I let you go to visit the next blog, I want to share an easy, DIY favor idea. A few years ago I posted a recipe for Chocolate Cinnamon Heart Cookies. I just made them again and updated the post by adding a printable bag topper for packaging. These would be perfect for any sort of party or gathering. They would also make cute teacher gifts or classroom treats. Now it’s time to send you on to Taryn’s blog, Design, Dining & Diapers. If you’ve never been there, you are in for a treat. 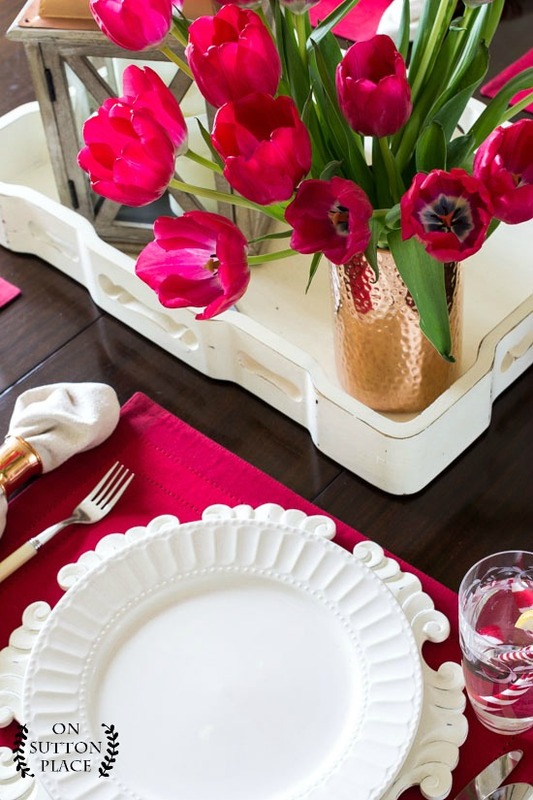 Taryn’s style is stunning and she shares everything from decor to recipes to entertaining tips. Here is the rest of today’s line-up…along with all the posts from earlier this week. Your table is LOVELY! I SO enjoy your blog! I cannot find information about your beautiful dining room wallpaper anywhere though! I know I’ve seen it in a book somewhere…is it Waverly? I’m so glad wallpaper is making a comeback! Hi Diane! The wallpaper is in a discontinued Waverly book called Williamsburg. It is, in fact, pretty old. I have searched it a few times for other readers but it’s no longer available. Thanks for stopping by! Oh what a beautiful table setting! Love those Moscow mule mugs with cute straws! 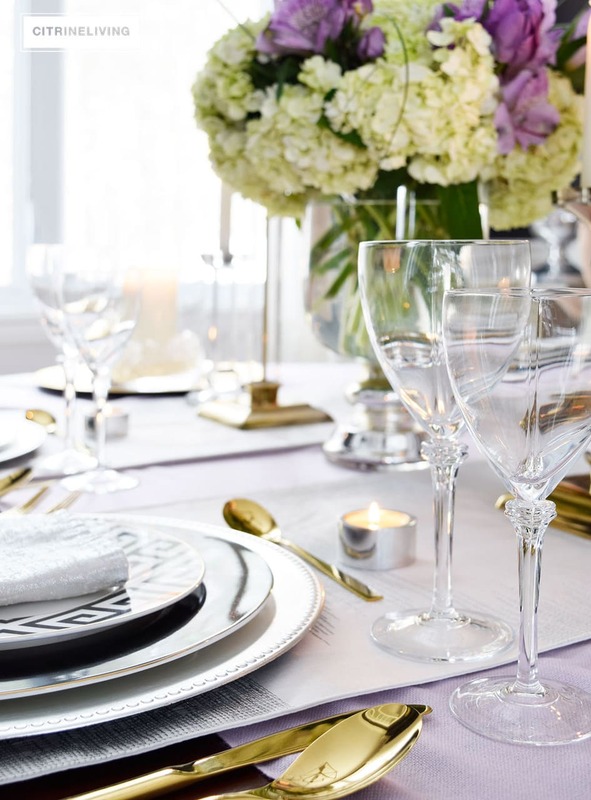 Your table setting is beautiful and doable. As are the chocolate heart cookies and that adorable Valentine bag topper. Thank you for sharing your creative talents with all your readers. I always enjoy reading comments left by others and saw your comment expressing blog tours sometimes cause your insecurities to surface. Let me reassure you that you more than measure up; you truly are a blogging rockstar (terms used by another loved rockstar blogger.) I look forward to seeing everything you post, and you are an inspiration to me to be a better blogger. Ann, what a lovely table you’ve set for a romantic dinner! 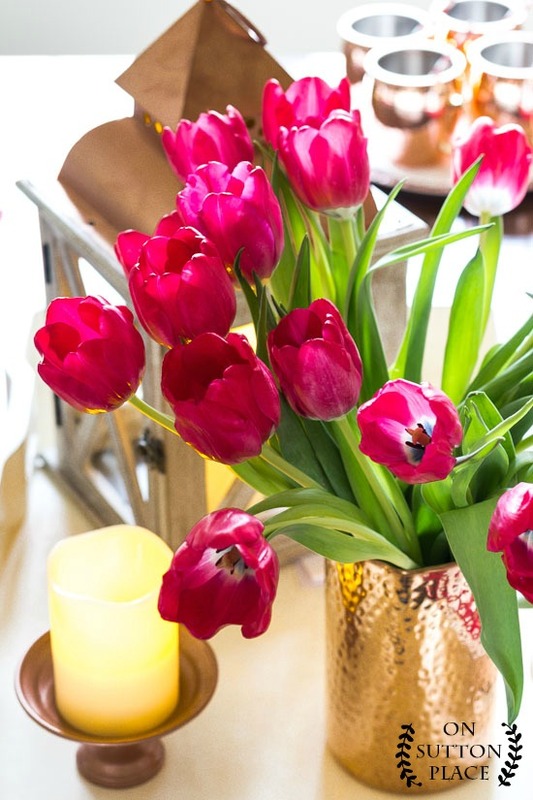 The red tulips are just beautiful and really make a bold statement. I’m fascinated to read about how others build their tables – where they start and what the process is that follows. I typically start with the plate stack, so it’s most interesting to me. I also think you’ve achieved exactly what you were going for with your farmhouse touches. They add such a note of charming warmth! Ann, thank you for the inspiration. 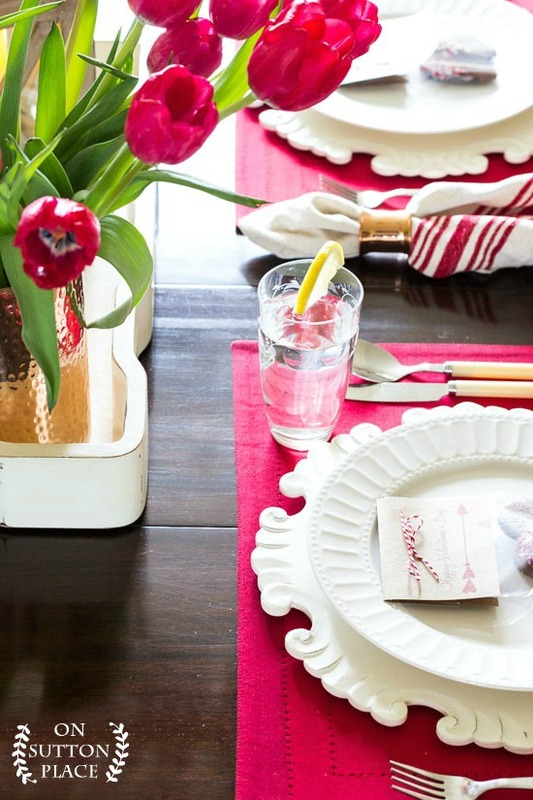 Another proof that just a few simple thoughtful touches can create a beautiful table setting. I hadn’t paid enough attention to the power of linens, but you (and your grandma) are right– they do add a special touch. And the tulips are the best! Hi Ann, Your table is always my favorite. I’m off th Pier One for the placemats. Where cam I find the checked red and white pillow cover? It is a bigger check pattern than the one pictured. Also, if you want to order, wait until Sunday. They will be 20% off and free shipping! Ann, the pillows and cases “sets” arrived today. Pillows are 23×23 while the checked cases are 20×20. They don’t fit! I ordered 20×20. You work too hard at your job to have to have someone in “order fulfillment” in Santa Monica, CA mess it up for you. I hold you blameless, but thought you would like to know. 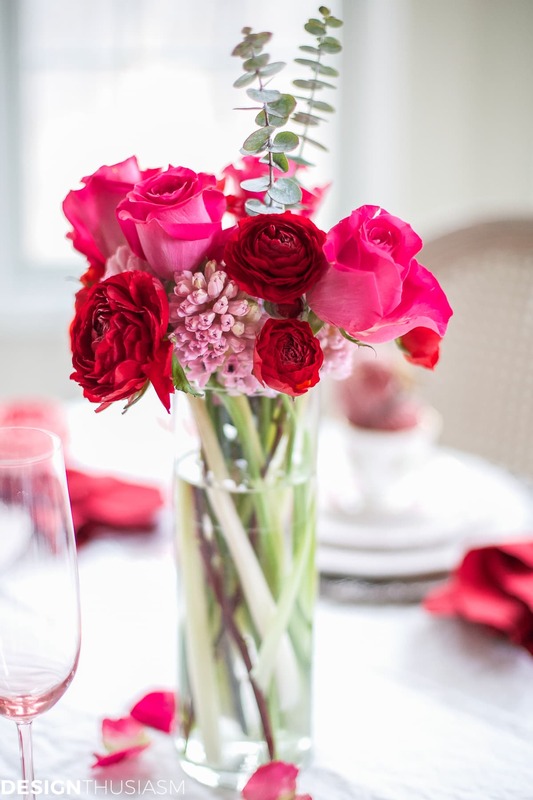 Hi Ann, I am loving your table scape for Valentines. Just beautiful, not too over the top, but especially elegant. I too love fresh flowers and those tulips are gorgeous. Not to forget those delicious looking cookies, who doesn’t like chocolate and sprinkles, we’re all kids at heart. LOVE IT ALL!!! new subscribers or can us “oldies” print them too?… and if so, how? I am sending the banner to my current subscribers in just a few days. Stay tuned! 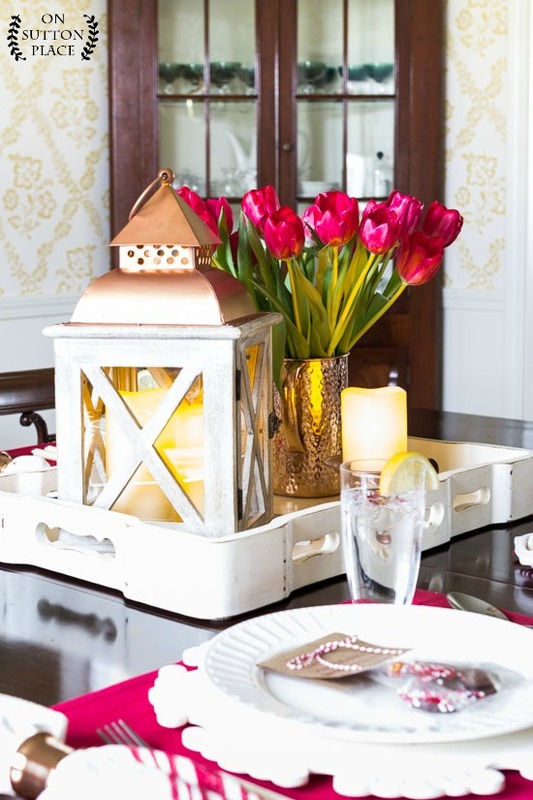 I love that you are putting links to the beautiful items on your lovely table! I love the colors!!! So Romantic and who doesn’t love fresh flowers. My sweet “Granny” always said to give people flowers while they are living..don’t wait until people die. I love your blog! Ann, this is so beautiful! You are speaking my language with the RED. And the heart cookies are darling, making those for my family soon. 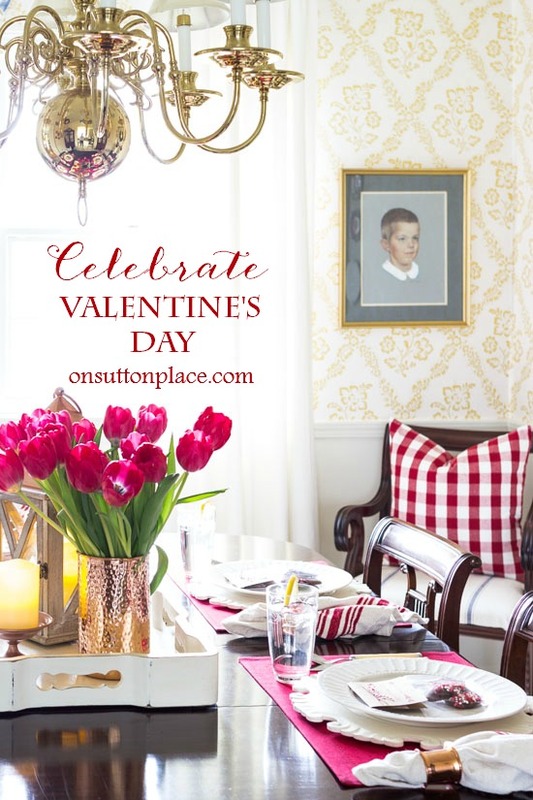 I am thrilled to be on this Valentine Styled & Set Tour with you! Lovely table but the best part are the cookies ! Good morning, Loved the red/white tablescape, sometimes a two color scheme is the best! 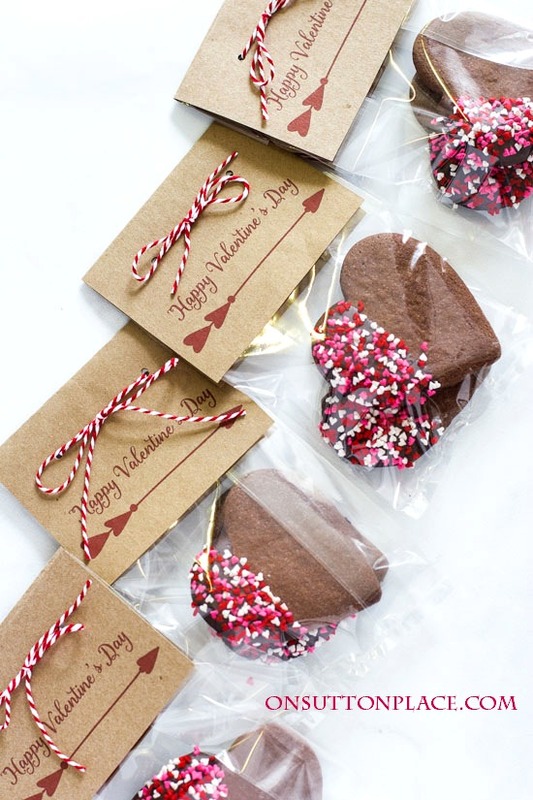 Great idea for packaged cookies as a gift. Thanks for all you wonderful ideas. Ann, when there are blog tours I nearly always like yours best. Thanks for showing up in my emails! Good morning Ann, pray you are feeling great! Just wanted to let you know that I look forward to your postings, your style of Everything is simply elegant, rustic with a touch of elegance. I’m not easily impressed but I like your style. Probably because it is like mine. Look forward to your next post. Have a great day. 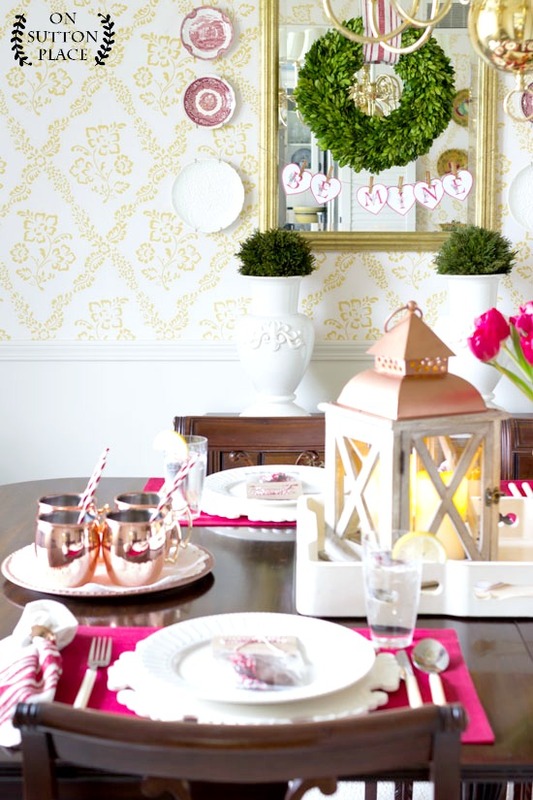 A pretty table for Valentine! The packaging for the cookies is On Sutton Place adorable:).